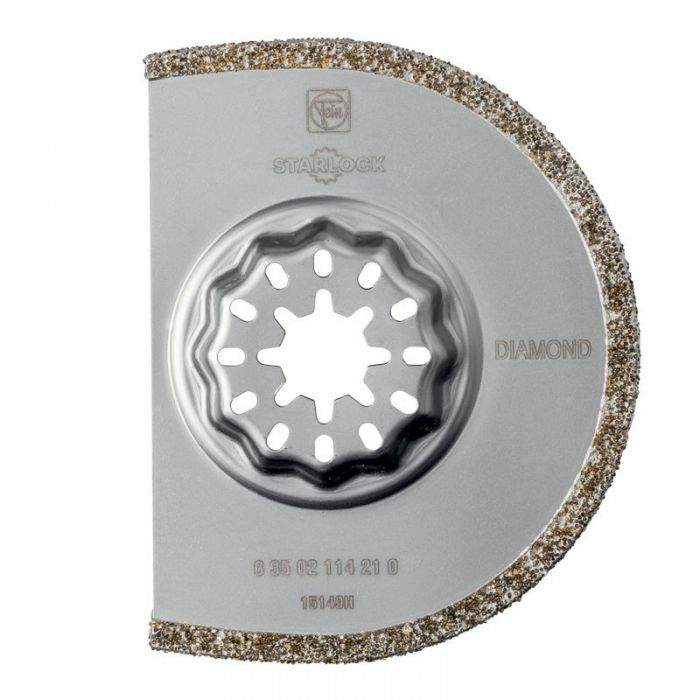 This 3/32" wide diamond blade is excellent for degrouting all types of tile joints. The 3/4-moon shape make it ideal for flush degrouting and working in corners. Starlock (SL) mount for fast and easy accessory changes - Fits the Fein MultiTalent, MultiMaster, SuperCut, Bosch, Makita, Rigid, Milwaukee and others. This Diamond Blade is the best option for degrouting all types of tile joints, and especially for epoxy grout joints to give longest service life. The blade generates no airborne dust and is "tile safe" since the oscillation action does not cause the blade to climb out of the tile joint like other tools. The 3/4-moon shape allows flush degrouting and working deeper into corners. Blade is 3" diameter, cuts about 3/32" wide and up to 1/2" deep. Not intended for cutting ceramic tile or stone. The Starlock mount offers fast, secure, tool-less blade changes - in under 3 seconds - and 100% power transfer due to the 3D tool mount. Blades are extremely rigid for precise cutting results. Starlock Blades will fit the Fein MultiTalent, MultiMaster, SuperCut, Bosch, Makita, Rigid, Milwaukee, and others.